Well done to me. I did have a post written here that I edited out when creating my next subsequent post, (reuse the template each time, and accidentally edited this post rather than creating a new one!). 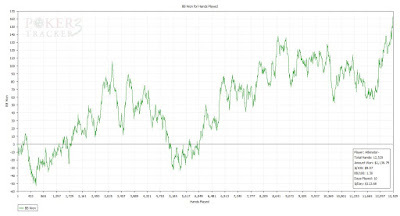 I seem to remember commenting on hitting a very nice upswing right at the end of my most recent session. Something to do with a lot of donkey players around at the weekend. I definitely mentioned a hand where a guy 20 or 30 bet me preflop with AJs when I had AA, and we got it all in for a €160 pot. Well done that man. 2 Comments to "LHE Challenge: Days 8-10"